On a small stack of notebook sheets creased and browned by time, ledgers belonging to the prominent AL Mills family, is a record of daily visits by a “Vegetable Man” in Portland in 1907. Some days, he sold twenty cents' worth of produce to the Mills family; other days, he pocketed a bounty of more than a dollar. He has no name, no age; there is no clue as to who he was or what particular vegetables he harvested and hawked on the streets of Portland more than a century ago. There is only proof that the peddler was paid. That he was, as referenced simply in later Mills household ledgers, a “Chinaman.” And that he likely hefted his produce in wicker baskets hung from a pole and slung across his shoulder, trekking uphill from the gulch along Tanner Creek in Southwest Portland where his garden grew and along the hill to the Mills' mansion every day, faithfully, for much of 1907. 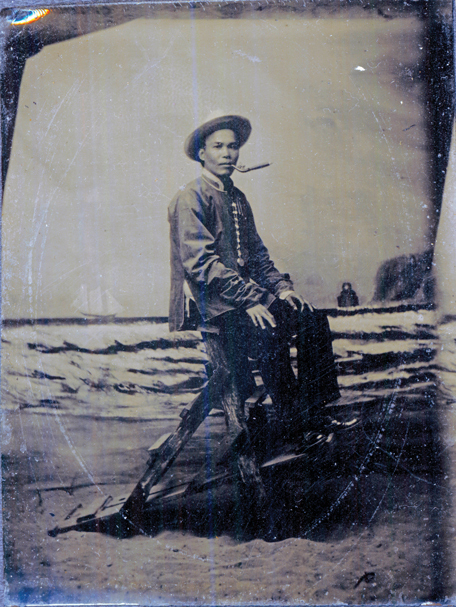 The Vegetable Man was one of dozens of Chinese immigrants, mostly men, who eschewed life amid the laundries and lotteries of downtown Chinatown, opting instead to eke out a living on the fringes of town in what soon became the moneyed neighborhood of Goose Hollow. 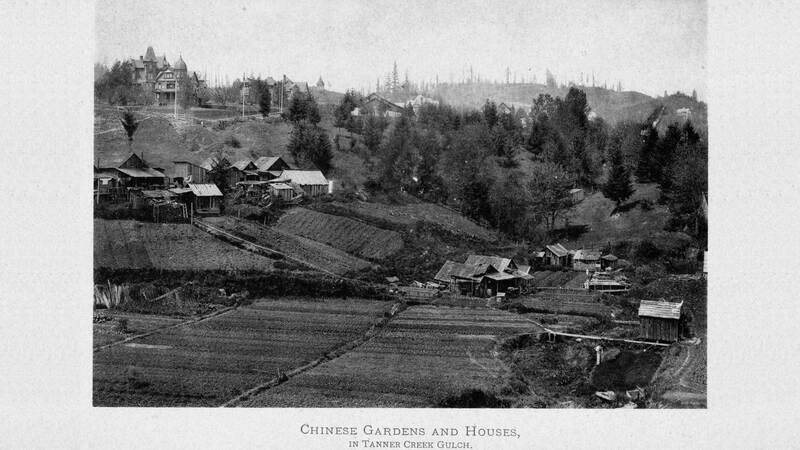 The gardens cultivated by the Chinese farmers supplied Portland residents with a daily selection of fresh fruits and vegetables while providing many of the city's earliest Chinese immigrants with a steady stream of income starting as early as 1879, when the first known Chinese gardens sprouted in the foothills overlooking downtown Portland. No one is alive to say for sure why, but by 1910, the vegetable gardens and the men who tended them with relentless efficiency began to rapidly disappear. Likely it was some combination of elements that eroded the Chinese garden community in Portland: explosive urban growth in the early 1900s, racist practices and exclusionary laws, and local policies that restricted the Chinese gardeners' ability to sell their produce. As Portland navigates its latest round of explosive urban growth, the story of the Vegetable Man and the other Chinese men who cultivated seasonal crops in the clefts of Portland's West Hills has become a potent analogy to understanding the present. It is a familiar story of immigrants straining to survive on the margins of society, working lands they could not legally own, and ultimately being displaced by development and the kind of hard-charging progress that has both defined and undermined the Rose City. In this way, it is the story of now. On a drive through Goose Hollow today, pedestrians stroll down the street toting Trader Joe's bags and yoga mats; telecommuters hunch over lattes and laptops at Starbucks shops tucked into tiny strip malls. There, in a natural bowl in the earth adjacent to the Multnomah Athletic Club, roaring fans cheer as the Timbers dribble a soccer ball up and down the field on sun-dusted summer evenings, while stately mansions perch along the hills above. That is where, more than 120 years ago, the farmers once plowed perfect rows along the slope, creating one of the largest Chinese gardens in Portland. Back then, the Goose Hollow neighborhood was a palette of uneven, uninhabited land knobbed with hills and prone to flooding. This land was marshy and undesirable. But it was land that, to the Chinese men who originally immigrated to the United States to work on the railroads, was perfect for farming. No one can say for sure what brought the first Chinese gardener to the West Hills in 1879, but it was probably the lure of that wild land and an interest in cultivating crops that many had brought from their homes in the agrarian Pearl River Delta of China, an area known for terraced farming, according to Marie Rose Wong, who wrote about the Chinese gardens in her book, Sweet Cakes, Long Journey. “It's likely that no one really thought of creek bed land as being as productive as it was, and since the Chinese could never legally own the land, they could be easily displaced,” Wong says. Wong writes that Portland city leaders, anticipating the growth of the city, eventually turned their attention to the Tanner Creek gulch area located between W Burnside and SW Morrison Streets and 14th and 17th Streets. When a wooden bridge over the creek that connected the burgeoning neighborhoods from 14th Street to 17th Avenue North collapsed during a flood in 1873, the city used the calamity as an opportunity not only to repair the bridge, but also to tame Tanner Creek. That summer, the City of Portland contracted Chinese workers to build a 115-foot cylindrical culvert to pipe the creek sixty feet below Burnside Street, a solution that both controlled and ultimately prevented flooding in the area. Maximizing every opportunity to make a living, and seeing the potential for fertile fields fed by Tanner Creek, the Chinese men who built the culvert remained in the area and began farming the sediment-rich lands, according to Wong. This led to the first recorded Chinese gardens in 1879, which lined both sides of Tanner Creek on a narrow swath of land along Burnside. The men worked and lived collectively, traveling between Chinatown and the West Hills to sell their produce. Because of exclusion laws that prohibited Chinese women from immigrating to the United States and anti-miscegenation laws that banned interracial marriage, many of the gardeners remained bachelors, living out their days as laborers without families. Instead of looking to start families and settle in America, the men focused on their farm work, sending their earnings back home to their families in China, according to local historians. Fed by the nutrient-rich creek water, the gardens grew from only a few acres in 1879 to more than twenty acres a decade later. And the Vegetable Man, along with dozens of other Chinese gardeners, made a modest living peddling his vegetables door-to-door. Local lore is that the Chinese gardeners doubled down on the day's work by selling their vegetables door-to-door to Chinese cooks living in the mansions of Goose Hollow, and then loading up laundry for the return trip down the hill, delivering it to downtown Chinatown laundries—a demonstration of the resourcefulness that came to define the city's Chinese immigrant community. By the early 1900s, the abundant and beautiful Chinese gardens and the men who peddled the vegetables plucked from the fields became a permanent part of the city's streetscape. The men had found a successful way of earning a living and surviving in a new land. 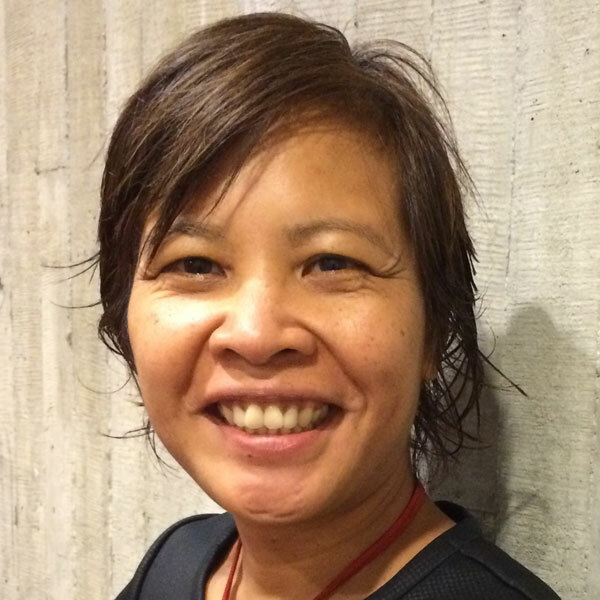 a degree of entrepreneurship and financial independence,” Wong says. However, discriminatory policies restricted the gardeners' success. Oregon's state constitution of 1859 barred anyone of Chinese descent from owning property, which meant that the Chinese gardeners could be evicted from their farms at any moment. As the city of Portland grew, so, too, did the threat that the gardens would eventually be squeezed out of the West Hills. Development quickly began to impinge upon the lands covered by Chinese gardens. The farmers existed against a backdrop of the American dream that was literally within sight but impossibly out of reach. They built and lived in shanties constructed with assorted scraps of wood in the shadow of mansions owned by such business tycoons as Amos King, and Thomas Carter—two disparate worlds cordoned off with a lengthy span of wooden fence. “Right across from the shanties were the wealthiest people in town,” says local historian Norm Gholston, who has spent the past several years researching the Chinese gardens. The gardens became increasingly vulnerable to development. In 1893, the Multnomah Amateur Athletic Club (later renamed the Multnomah Athletic Club) leased a five-acre tract of land in the Tanner Creek gulch, and over the next eight years, several Chinese gardens and shanties where displaced. By the early 1900s, the Multnomah Athletic Club began building out its facility, ultimately constructing a sports field that is now the modern-day Providence Park. The gardeners responded by simply relocating their farms and shanty buildings farther south along SW 20th Avenue and Jefferson Street. But more development was on the way. One of the city's biggest growth spurts occurred soon after the city hosted the 1905 Lewis & Clark Centennial Exhibition. This world's fair attracted more than 1.6 million visitors and spurred the arrival of a massive number of new residents in the following years: Portland's population spiked from 161,000 residents in 1905 to 207,000 in 1910. But development was not the only pressure that ate away the Chinese gardens. City leaders further accelerated the demise of the garden community by creating strict policies that governed street peddlers. In 1897, the Portland Common Council adopted an ordinance requiring street vendors within city limits to obtain a license—a move that angered white owners of several fish companies that were affected by the law. The white business owners protested and by 1910, the city adopted an additional ordinance limiting the area of downtown where street peddlers could sell their wares to an area that effectively covered most of downtown Portland. Those who sold meats, fish, ice, bread, and newspapers were exempted from the ordinance, which effectively banned only the Chinese vegetable peddlers from operating, according to Wong. The Chinese farmers suffered a final indignity in the form of overt discrimination by rogue groups of young white men bent on trouble. Prince says an active chapter of the Ku Klux Klan was known to harass and persecute Chinese gardeners and peddlers for sport in the early 1900s, and news stories from the time reveal how the Klan eventually burned Chinese farmers and ranchers off their lands. There are no traces left of the Chinese gardens, or of the men who spent their days tending the land. But if you ever go to Providence Park to cheer for the Timbers, or if you live in a part of Goose Hollow where the land slopes and curves into a bowl, this is what you should know: that a Vegetable Man, a long time ago, was there, planting his way into an American dream that was out of bounds in his lifetime. It would be another three decades before Chinese immigrants could legally own land, beginning in 1943, when the Chinese Exclusion Act was repealed. After this, Chinese families could move into neighborhoods with less fear of being chased out by unfair laws, encroaching development, or men in hoods. Jeff Lee, the great-grandson of a Chinese hog rancher and vegetable farmer in Northwest Portland, was surprised to learn that his great-grandfather, who lived on and farmed a swath of land near Linnton for more than twenty years, may have been among the immigrants driven off their land by the Klan. Lee's great-grandmother is believed to be the first recorded Chinese American born in Portland, in 1866. She spoke no English but lived on the farm with Lee's great-grandfather. They had at least eight children, one of whom was Lee's grandmother, who was one of the first Chinese Americans to buy a home in what is now the Ladd's Addition neighborhood. Lee wonders how his great-grandparents did it—how they built new lives from scratch and eventually snatched an edge of the American dream and held on. Yes I disagree with Gaston's "top ten list" comment and agree with Mr. Gholston because very soon after or by 1871 you have the MacLeays, Kamms, Harlows, Quackenbushes, Holmans, John Wilson and some of the most prominent Haut-Ton pioneer Portland families surrounding these shanties on all sides. Painting Goose Hollow as a 'gaggle' of squabbling immigrant laborers is only accurate up to about 1868, quaint as that image may be. Walidah Imarisha on revealing the stories and struggles of Oregon’s African American communities.